The Xiongnu were a confederation of nomadic peoples that lived on the eastern Asian Steppe. Ancient Chinese sources report that the Xiongnu Empire was founded by a leader named Modu Chanyu after 209 BC. Ancient Chinese texts also claim that the Xiongnu had inhabited the steppe since the 3rd century BC. The Xiongnu became a dominant power on the steppes of north-east Central Asia during the 2nd century BC, and their empire lasted until the late 1st century AD. This empire centred on the region that we today know as Mongolia but also encompassed parts of Siberia, Gansu and Xinjiang. The Xiongnu had a complicated relationship with the Chinese dynasties, with periods of hostilities and openly violent conflicts alternating with epochs characterised by mutually beneficial trade and even intermarriages. 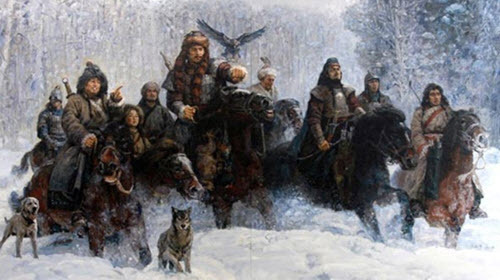 Numerous attempts have been made by historians to genetically or culturally link the Xiongnu with population groups that inhabited the Eurasian Steppe long after the fall of the Xiongnu Empire, but the subject is controversial due to a lack of reliable evidence. One of the most well-known hypothesis is the one linking the Xiongnu with the Huns. In the 18th century, the French scholar Joseph de Guignes proposed this link, and since then, considerable effort has been put into the subject, but no scholarly consensus has been reached so far. The identity of the ethnic core of the Xiongnu is another issue that’s been heavily debated and where no consensus exists. Based on (very scarce) linguistic remains found in Chinese sources, the ethnicity has been variously suggested as Mongolic, Turkic, Uralic, Iranian, Yeniseian, Sinitic, or multi-ethnic. According to researcher Irma Marx, herding was the basis of Xiongnu economy. Originally, almost all Xiongnu were pastoral nomads who lived in tents, but by the first century, BC settled populations had developed. These settled populations combined livestock raising with growing millet, barley and wheat. The Xiongnu were skilled at using a bow and arrow from horseback. A Xiongnu man could have multiple wives. When a married Xiongnu man died, the widows would marry their late husband’s younger brothers or his sons (born to another of the wives). If a great chief died, his wives and servants could be killed and buried with him. According to Chinese sources, the Xiongnu worshipped heaven, earth, the sun, the moon, and their ancestors. 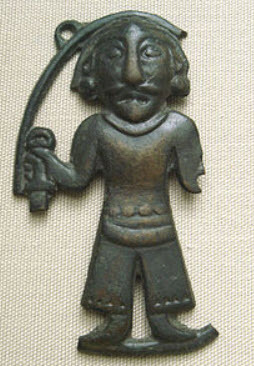 The culture was shamanistic, and shamans could have a major influence over the other members of the group. The Xiongnu held special ceremonies where they sacrificed white horses and drank the blood. The horse was extremely important for the Xiongnu; in both wartime and peacetime. The Xiongnu made household utensils, ceramics, weaponry, jewellery, and tools (including fine tools). They had workshops where iron and copper alloys were smelted. Information regarding the language of the Xiongnu is very scarce. Some sources indicate that it might have been a part of the Turkic language group. The Xiongnu has left no evidence of writing. 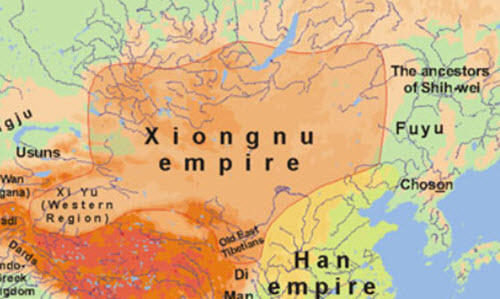 The Xiongnu Empire started losing ground during the Chinese Han dynasty (206-220 AD) as the Chinese Empire expanded its size. The battles took a huge toll on the Xiongnu who lost many men and horses. The situation also caused tension within the confederation, and many tribes left it to become vassals to the Chinese instead. In Outer Mongolia, the northern Xiongnu left, as they went to live in Dzungaria instead; a geographical region in northwestern China corresponding to the northern half of Xinjiang. Eventually, their leader was beheaded by the Chinese army. After this, there is no more historical record of the northern Xiongnu. The southern Xiongnu took over Outer Mongolia once the northern Xiongnu had left for Dzungaria. At first, there was no war between them and the Chinese. Around the year zero, the southern Xiongnu spread into Dzungaria and the relationship with China started getting more tense, although some Xiongnu tribes living along the borderlands remained vassals of China and served as a kind of buffer between the other Xiongnu tribes and the Chinese. In the first century AD, a Tungusic / Mongol people called the Hsien Pei conquered Mongolia, which prompted a lot of Xiongnu to migrate into Dzungaria. A hundred years later, the Hsien Pei was in control of Dzungaria too, and we don’t hear about the Xiongnu after the year 170 AD. One notable exception is the relatively few Xiongnu tribes that lived along the Chinese border; they keep showing up in Chinese sources until the 5th century.